I have been wanting to cook one of these bad boys for a long time. While I was out morel hunting and practicing my skills being the King of Morels and owner of “Precious”, I happened upon a King Bolete. I was so excited I picked it I ran back up to show my wife, she was not as excited as I was. 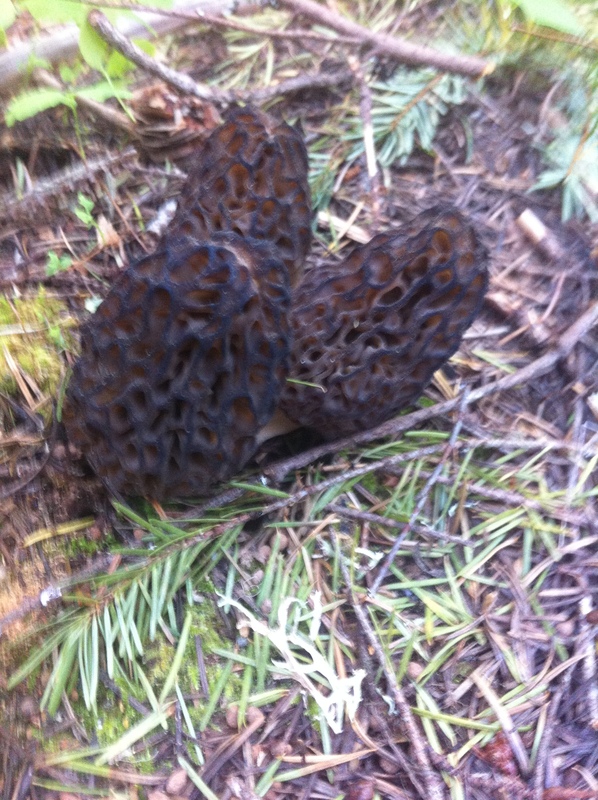 The morels had not started to show up in numbers yet, still a pretty slow year. I have only found one King Bolete in my life and it was not edible so I took my time identifying it to make sure it was in fact a King Bolete. I am hard enough on my liver as it is, do not need my liver shutting down over a bad mushroom. The biggest decision that I had to make is how I was going to cook it. I did not want to put it in a soup, or mix it with too many ingredients. I wanted to taste it, I wanted to experience it. The first thing I had to do was to clean this beauty. The first thing is to cut the stalk and get the dirt off of it. That is chopped garlic on the right. From the research I did, they say that you do not want to use a lot of water to clean it because the caps will get slimy. I cut the dirt off the stalk and rubbed the mushroom off with water. The second important thing you need to remember is that you need to make sure there is no bug infestation. The easiest way is to slice it and check. 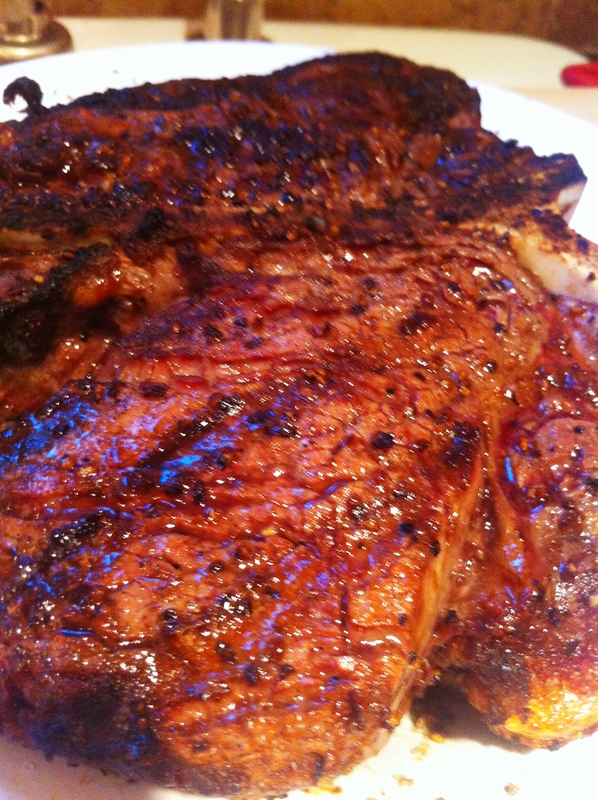 Ooops I forgot the second most important thing is to make sure you get a great porterhouse two inches thick! 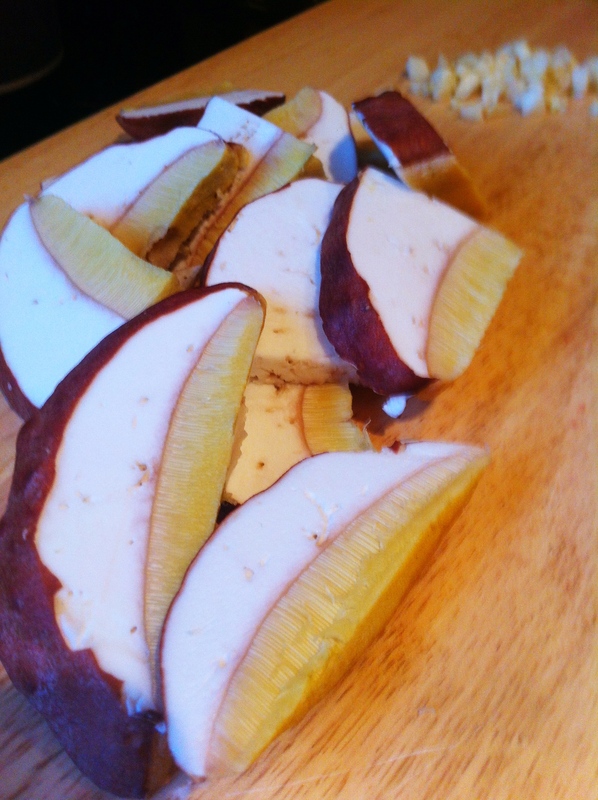 I slice the mushroom in about 1/8 thick slices, because I want texture and taste. I was a little discouraged because this Bolete was barely visible and fresh. I guess the bugs love them as much as humans do. 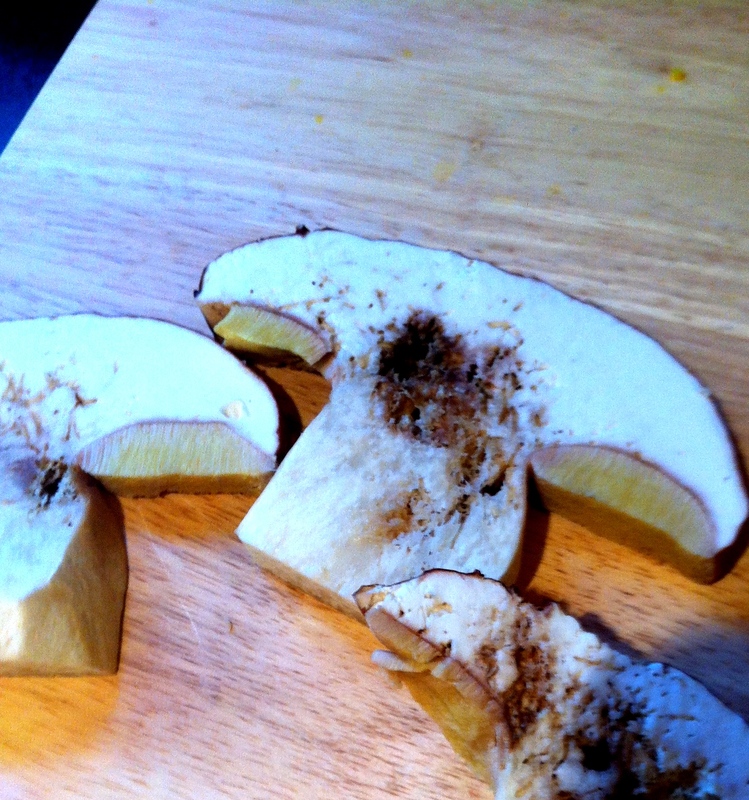 I lost half of my King Bolete but was able to save the other half if that. I probably only got a third saved from those wretched little beast but at least a little was more than none. 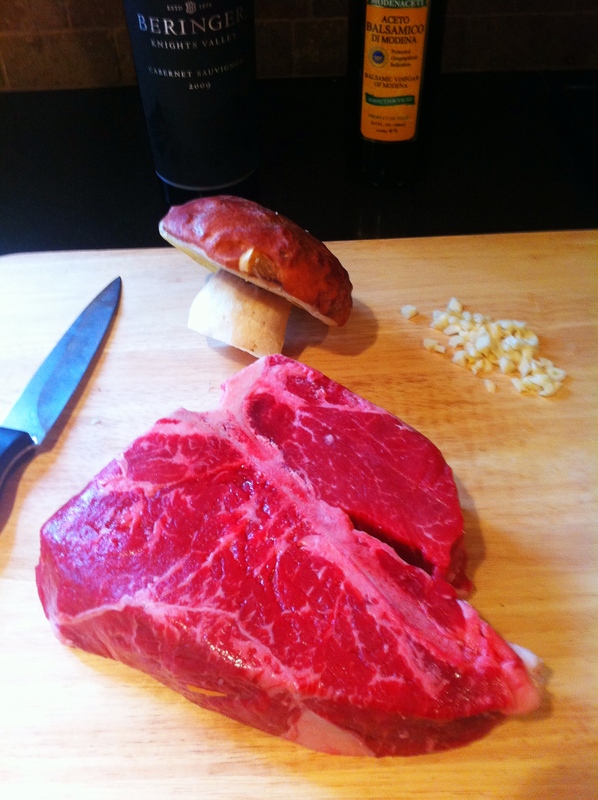 I figured the best way to prepare this would be simply using fresh garlic, a tablespoon of butter, with olive oil on medium heat. I do not advise high heat with this mushroom. 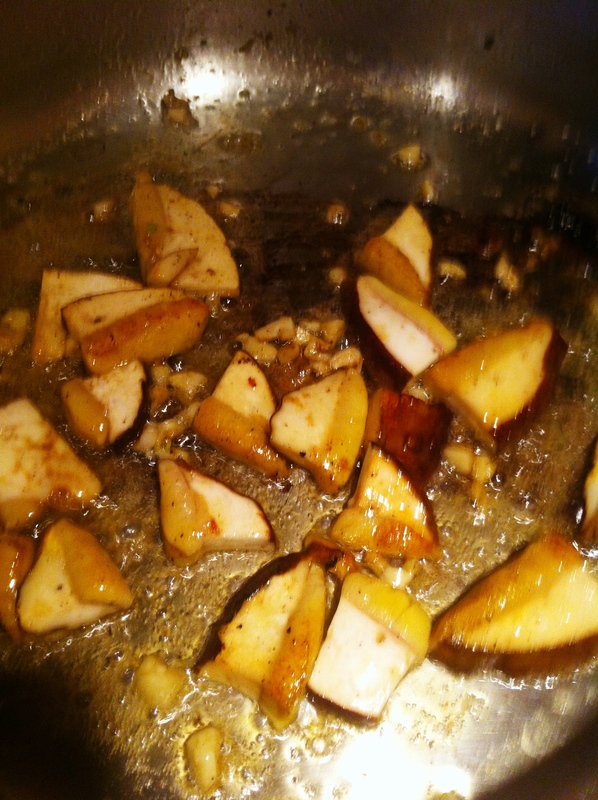 Begin with caramelizing the garlic in the olive oil and butter, then after half way to the garlic turning brown add the mushrooms. My season steak is already off the grill and resting. I had corn and asparagus in the fridge so I decided to shave the corn off, and utilize the spears. It was sweet corn, so all I used was a tablespoon of olive oil, and some salt. The mushrooms were taking on color and I would serve them on the side, with a little crumbled blue cheese on the side so you could taste the mushroom and add some flavor with your fork if you wanted too. As I was getting ready to plate I asked my lovely wife if she was ready to eat because she ran a half marathon that day and was a little busy. 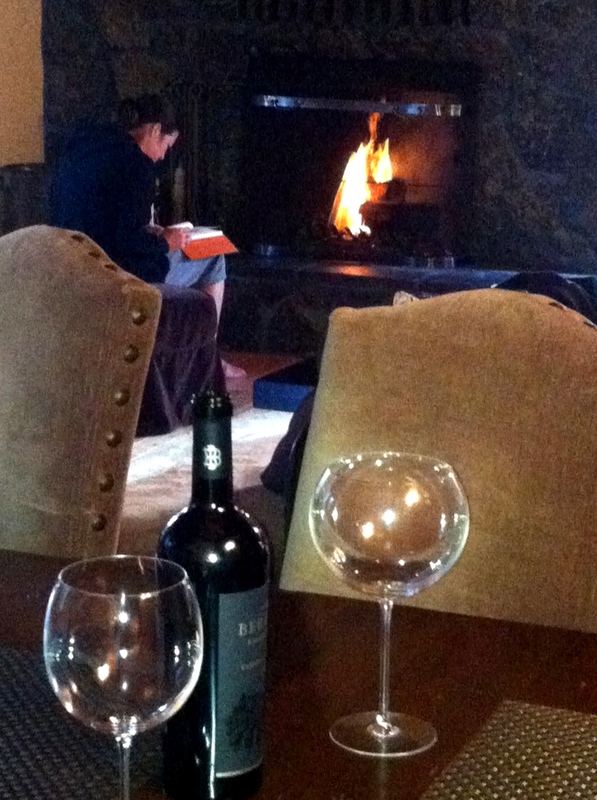 This is Steph being really busy….reading a novel by the fire. 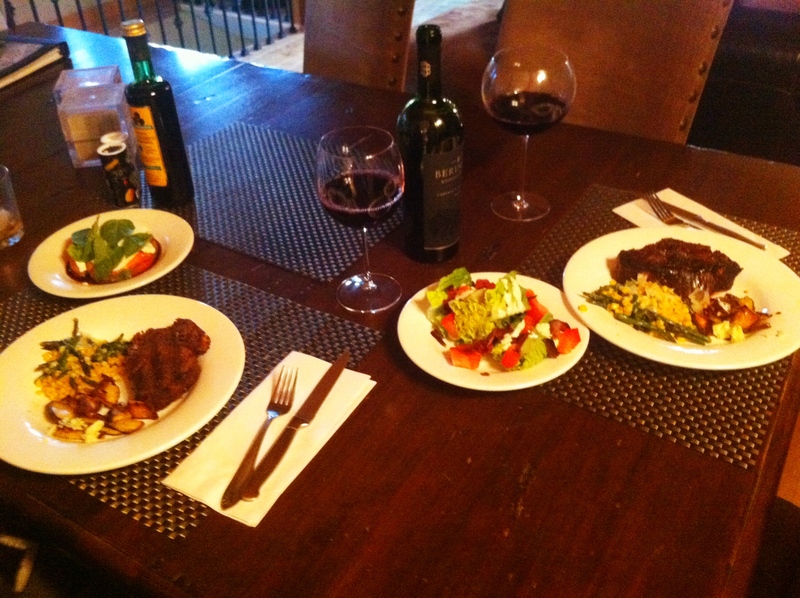 I cut the meat to serve, filet obviously went to the Queen as I prepared the New York cut for myself. The King Bolete did not disappoint. It had texture, and great taste. I will definitely be looking for some more of these gems in the woods. 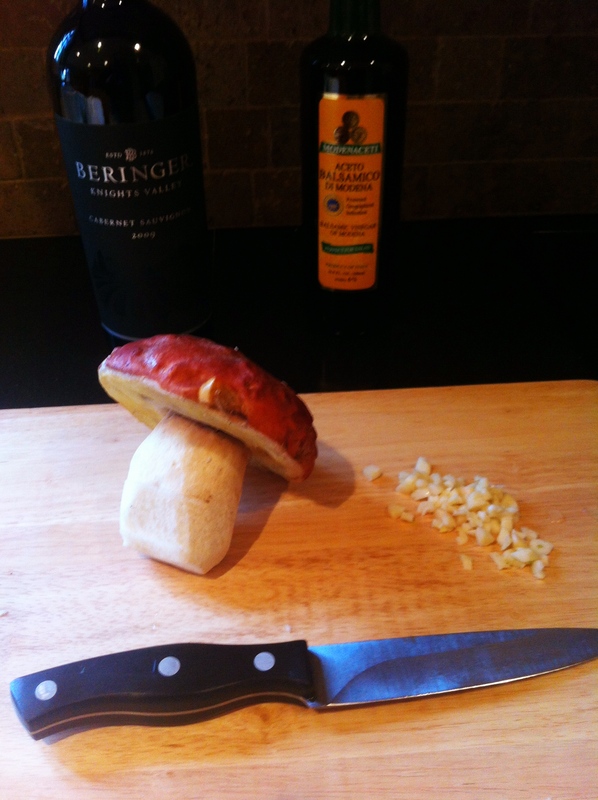 I wonder what Trevor and his family were eating that night as I took another bite of King Bolete. 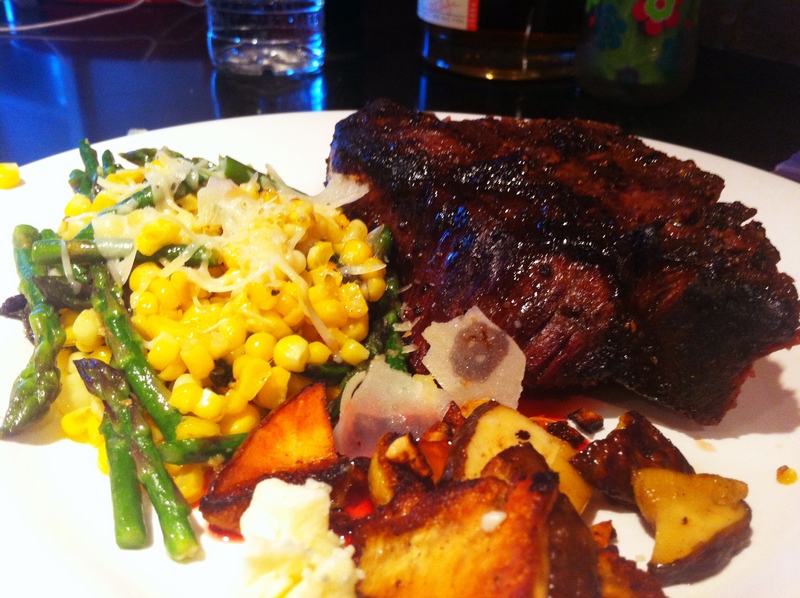 I did shave a little fresh parmesan on the corn asparagus side dish. I cannot wait to find another one of these King Boletes. I hope it inspires you to get out into the woods and enjoy the fresh air and look for edible mushrooms. It is not hard, just takes patience, a good eye and some research on if it is edible or not. Trust me, if I can do it then so can you. 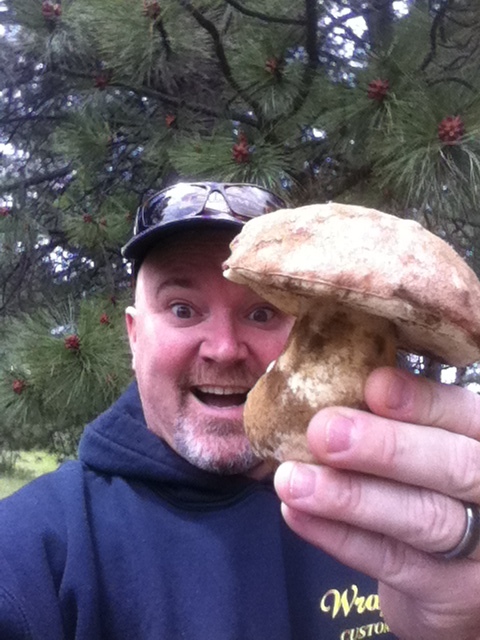 That is so cool that you can go out and pick your own mushrooms. I don’ think you can do that around Dallas, and the ones you can back where I grew up in Corpus….well, they do funny things to you.  I’ve enjoyed your blog so much, that I created a link to it on my page so hopefully others will come over and discover it, and reposted one of your posts of Facebook. Maybe that will drive some more traffic your way. Anyway, keep up the good work. Super easy to do. Open Dashboard, then look down till you see Links. Click on Add New. When that page opens, add Griffin’s Grub to Name, then my url to Web Address. That’s about all you NEED to do, but I like to go down to Target and click on open in new window, but that’s a personal thing. Then just click Add Link which is on top right of page. Just found about 3 lbs of the king last night at a cemetery. Had some with an omelet this morning. Freezing the rest for later this year. Yum! That is great! Chanterelles are beginning to pop in Oregon.